Windows 10 doubles the number of promoted apps, Google launches a new messaging app, Twitter makes room for more words, the BBC has one eye on Netflix, and a short film made entirely of stock footage. Microsoft is planning to show more ads [PDF link] on the Windows 10 Start menu, doubling the number of promoted apps from five to 10. As reported by The Verge, this is set to happen when the Windows 10 Anniversary Edition Windows 10 Anniversary Update Due in July & These Are Its Best Features Windows 10 Anniversary Update Due in July & These Are Its Best Features You will love the Windows 10 Anniversary Update! 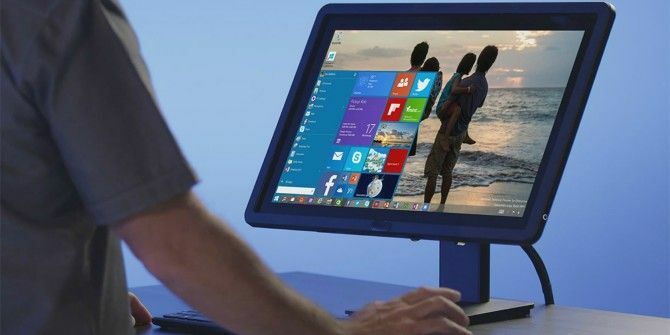 The second big upgrade to Windows 10 since its launch in July 2015 is expected this summer. Here we highlight the most exciting features. Read More drops at the end of July, marking one year since the release of Windows 10. As it stands, Windows 10 users can expect to see up to five promoted apps interspersed with their own apps on the Start menu. However, once the Anniversary Edition drops, that number will increase to 10. These promoted apps can be removed from the Start menu one at a time, but most people will simply put up with them. Or at least that’s what Microsoft must be hoping. The initial reaction to this change seems to be rather muted, as if everyone expected it. Which, given that Windows 10 is being offered as a free upgrade Windows 10 Upgrade - Free Doesn't Mean It Won't Cost Anything Windows 10 Upgrade - Free Doesn't Mean It Won't Cost Anything There's a catch to the free Windows 10 upgrade. Microsoft understands its audience all too well; they are more likely to pay for the freedom of control, rather than for extra features. Read More , they probably did. Microsoft has to make money from Windows 10 somehow, and putting apps in front of 300 million users and rising is a rather obvious way to do that. Google Spaces reminds me of Facebook Rooms, which Facebook killed because it didn't take off. Google has launched a new social messaging app called Spaces. The app offers a way for you to discuss specific topics with friends and family members. And with Google Search, Chrome, and YouTube all built into the app, you shouldn’t ever have to switch between Spaces and other apps. Here’s how Google Spaces works: You create a Space on a topic you’re passionate about. You then invite friends via email, a message, or social media. You can then share content and discuss the topic to your heart’s content. All without ever leaving this one app designed to do it all. Google has launched several social apps over the years, and all have failed to really take off in a big way. Google+ was the last big push, and that is slowly being dismantled Let Google+ Die Already, Pushbullet Screws Free Users... [Digest] Let Google+ Die Already, Pushbullet Screws Free Users... [Digest] Google relaunches Google+ again, Pushbullet pushes people to pay, Google releases the Chromebit, teach kids to code with Minecraft, and the first trailer for A Very Murray Christmas. Read More as we speak. Whether Spaces fares any better remains to be seen, but anyone with a Gmail account should be able to check it out now [No Longer Available]. Twitter is changing the character limit in tweets. Not by much, but every little helps. According to Bloomberg, while each tweet will still be limited to being 140 characters, links and photos will no longer count towards the total. Links are already shortened in order to free up space, but they still take up 23 characters, or over 15% of a standard tweet. This subtle change, which is likely to be pushed out in the next couple of weeks, would therefore give you room for an extra hashtag or two. Twitter has been wrestling with the problem of its 140-characters limit Internet Explorer Is Dying, Twitter Wants Longer Tweets... [Tech News Digest] Internet Explorer Is Dying, Twitter Wants Longer Tweets... [Tech News Digest] Internet Explorer gets Edged out, Twitter reaches its limit, Lumosity pays the price for allegedly deceiving people, play Rick and Morty on mobile, and avoid playing Pac-Man Powered by Moff. Read More for a while now, as users have started stringing tweets together or posting screenshots of longer messages to get around it. But the company knows that abandoning it altogether risks haring its unique brand. The BBC could be planning to launch a new subscription-based streaming service to rival Netflix. That is at least according to The Telegraph, which quotes from the British Government’s white paper on the future of the BBC that “some form of additional subscription services” should be developed over the coming years. Britflix is likely to exist alongside the BBC iPlayer 10 Tips To Get The Most Out Of BBC iPlayer 10 Tips To Get The Most Out Of BBC iPlayer What is the best in British entertainment? Is it on TV or on the radio? Either way, both media are accessible with the BBC’s iPlayer service. BBC iPlayer is a browser-based service that is also... Read More , but offer both older content as well as original programming made exclusively for subscribers 13 New Netflix Originals You'll Be Watching in 2016 13 New Netflix Originals You'll Be Watching in 2016 Netflix has released a lot of original content -- including House of Cards, Orange Is the New Black, Narcos, and Master of None -- but 2016 is slated to be Netflix's most exciting year yet. Read More . The BBC has yet to outline its plans officially, so we don’t yet know if this will be a UK-only affair or offered worldwide. And finally, stock photos The 15 Best Sites for Free High-Resolution Stock Images The 15 Best Sites for Free High-Resolution Stock Images Free high-resolution images are hard to come by. Wouldn't it be nice if you could get free stock images that are curated for quality and resolution? You can! Read More and stock footage 4 Stock Video Websites To Catch A Glimpse Of History Captured On Film 4 Stock Video Websites To Catch A Glimpse Of History Captured On Film There are quite a few other websites out there which host stock video footage from key moments in history. They playback not only eyewitness accounts, but also give us history lessons in video…as it happened.... Read More are both necessary evils. Without the former, a surprising number of MakeUseOf articles would be walls of text. And without the latter, film-makers would have to actually shoot meaningful footage. Which isn’t really feasible. How do you feel about promoted apps on your Windows 10 Start menu? Will you be installing Google Spaces? Should Twitter just ditch the 140-characters limit already? Would you pay to watch BBC content online? Do you love or hate the stock footage short film? "Giving it for free, because YOU are the product." Exactly. Regardless of any benefits Windows 10 may provide over previous editions, Microsoft is banking on cash from ads.